A new eco-friendly solar backpack has been launched which powers phones, cameras and other handheld devices for those on the move. 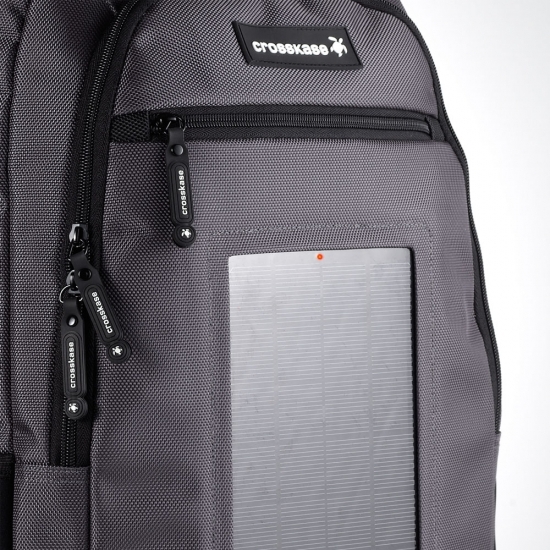 The CrossKase Solar 15 backpack features a three Watt built-in solar panel, which uses sunlight and artificial light to charge gadgets on-the-go and is one of the most powerful products of its kind. The CrossKase Solar 15, which has a 25 litre capacity, costs £139.99 including VAT from amazon.co.uk, store.apple.com/uk and crosskase.com. It measures 45cm high, 37cm wide and 12cm deep and weighs 1.7kgs including battery and solar panels. The integrated front solar panel uses trickle charges and stores the energy generated inside its high-capacity internal battery. It even works in the rain. The battery can also be charged from a USB computer connection or mains power. It fully charges many mobile phones, music players, navigation GPS, game consoles using sunlight in around six to eight hours. The solar cells have a 16% efficiency rate and will take 6-8 hours in the sun to fully charge a typical phone. Two hours provides about three hours of talk time. The battery includes power level lights to show how the charge is progressing. Extra battery packs can be bought to supply even more charge for those who have really high power demands. The CrossKase solar 15 backpack comes with nine adapter fittings to connect to Micro and Mini USBs and most leading makes of mobile phones and GPS systems. The water-resistant backpack is made from high-grade 1680D Ballistic Nylon. 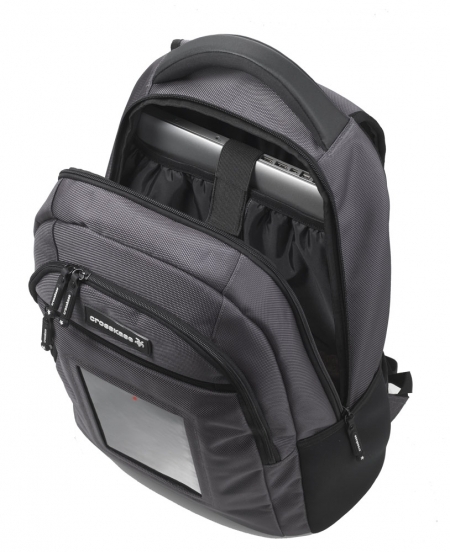 The stylish and practical backpack contains built-in pockets and storage space for laptops and iPads/iPods. A special airflow system is featured at the back, which provides extra comfort, support and a flow of air to cool the user. The CrossKase Solar 15 also features a hidden rain cover for extra protection when it rains. A spokesman says, "The Crosskase Solar 15 can help if you're bored on a journey and want your handheld gaming console to keep you company, but its run out of battery halfway or lost 10,000 feet high on a snow capped mountain and need help, but your phone has no battery and your GPS has died. "It can also help if you're in the boardroom for a business meeting and rely on your smartphone for your presentation notes, but you've left the charger at home. It will charge an MP3 player that is running low on battery or if you're rocking out at a summer festival and you've lost your friends en route to a band." CrossKase is a British company launched this year and aims to become the market leader in bag design and technology by keeping ahead of fast-moving technology and developing quality products.